We’ve been playing a lot today with the new Nvidia GeForce GTX 750 Ti graphics card based on the new Maxwell architecture from Nvidia, trying to overclock it as much as possible in order to get the best possible Scrypt mining hashrate out of the card using CUDAminer. The GTX 750 Ti card we have is a reference design one and it is a bit limited in terms of overclocking options, though we have tried pushing it to the maximum possible values to see what hashrate we can squeeze from the new GPU. We have already gotten about 265 KH/s with the default settings of the card, but overclocking it has increased the performance up to almost 300 KH/s whill still in the 60W power consumption (maintained by the power limiter of the graphics card). As you can see from the screenshot above our reference design board does not allow user control of the voltage and does not provide an option to increase the power limiter past the default value of 100%. This is done due to the fact that the TDP of the card is set at 60W and the board has no additional PCI-E power connector available, so it needs to fit in the 75W maximum power that the PCI-Express slot can provide to the card by specifications. 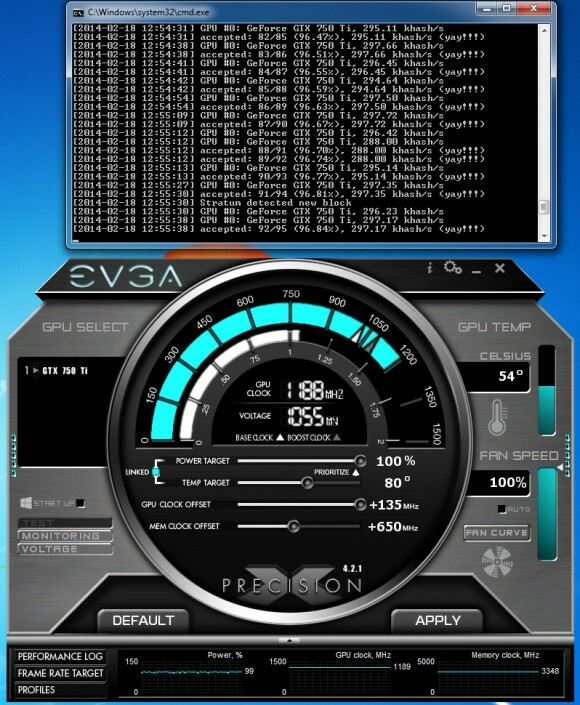 We have pushed the GPU to +135 MHz which is the maximum value that EVGA Precision and MSI Afterburner give us available and the video memory to +650 MHz as the maximum stable value resulting in about 297 KH/s hasrate that can be squeezed out of the 60W TDP (100% power limiter). What we have to do now is look for alternative boards that do not follow the Nvidia reference design and that do have more headroom for overclocking – PCI-E power connector and the ability to increase the GPU voltage along with the option for more than 100% for the power limiter. This can give us the ability to squeeze some more KH/s from the GTX 750 Ti as the GPU is clearly handling overclocking very well and can most likely handle even higher clocks without increasing too much the power consumption. As you can see with the fan of the very small and basic stock cooler at 100% the operating temperature of the GPU is just about 54 degrees Celsius, so with a better cooler higher clocks should not be a problem at all… after all 60W is something that is not hard to cool at all nowadays. We have just tried the card on a x16 PCI-E extender and there seems to be a problem with the normal operation. The fact that the card needs 60W over the PCI-E slot and has not external power over PCI-E power connector can cause problems if you wish to use extenders that do not have molex power connectors. So if you plan on using GTX 750 Ti with extenders it will be a wise idea to go for cards that do come with PCI-E 6-pin power connector on them to save some trouble. The x16 PCI-E extender we have tried works just fine with a Radeon R9 280X card, so the problem is not in the extender. What manufacturer are you using? Looking at picking a few of these up – they’re in stock on Newegg it seems. I’m assuming Asus/Gigabyte are still the reliable ones to go for mining performance? We have used a reference design Nvidia card. It is recommended to go for non-reference design boards with better cooling and PCI-E power connector such as the ones that Asus and Gigabyte offer if you are going to be using them for mining. 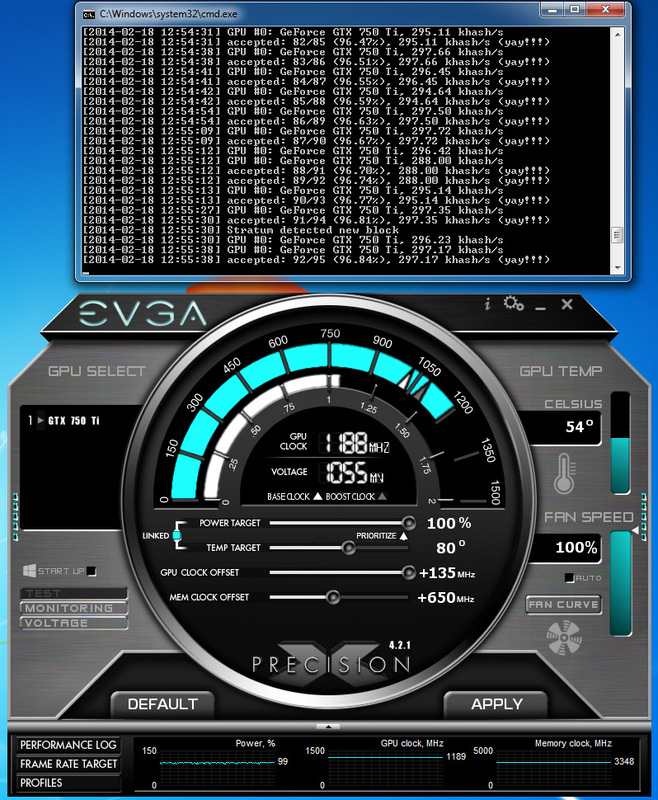 I got my EVGA 750 Ti 2GB FTW card today and im getting 330KH/s overclocked with the EVGA Precision software: GPU: +110MHz (1398MHZ) MEM: +750 (3450MHz) @45’C. Very happy with these numbers. To the moon! what options are you using in your bat file for cudaminer? I would love to know the configurations for the bat file as well since all the bench mark specifications I am seeing for that card don’t go above 300KH/s. What I need is GPU Thread Concurrency, Worksize, Intensity and Lookup Gap. x912, you do not need these settings for Nvidia mining, they are needed for the AMD GPU miner software. Ah I see thank you very much. It must have been a different error preventing me from mining then. I’ll have to look into it further then.